Dimensions 0.55 by 8.25 by 10.50 in. A Vanity Fair Best Book of 2014.Â A Kirkus Reviews Best Fiction Book of 2014.Â When three daunting dolls intersect with one hapless heroine and a hard-boiled private eye, deception, betrayal, and murder stalk every mean street inâ¦Kill My Mother. As our story begins, we meet Annie Hannigan, an out-of-control teenager, jitterbugging in the 1930s. Annie dreams of offing her mother, Elsie, whom she blames for abandoning her for a job soon after her husband, a cop, is shot and killed. Now, employed by her husbandâs best friendâan over-the-hill and perpetually soused private eyeâElsie finds herself covering up his missteps as she is drawn into a case of a mysterious client, who leads her into a decade-long drama of deception and dual identities sprawling from the Depression era to World War II Hollywood and the jungles of the South Pacific. Along with three femme fatales, an obsessed daughter, and a loner heroine, Kill My Mother features a fighter turned tap dancer, a small-time thug who dreams of being a hit man, a name-dropping cab driver, a communist liquorÂ store owner, and a hunky movie star with a mind-boggling secret. Culminating in a U.S.O. tour on a war-torn Pacific island, this disparate band of old enemies congregate to settle scores. In a drawing style derived from Steve Canyon and The Spirit, Feiffer combines his long-honed skills as cartoonist, playwright, and screenwriter to draw us into this seductively menacing world where streets are black with soot and rain, and base motives and betrayal are served on the rocks in bars unsafe to enter. 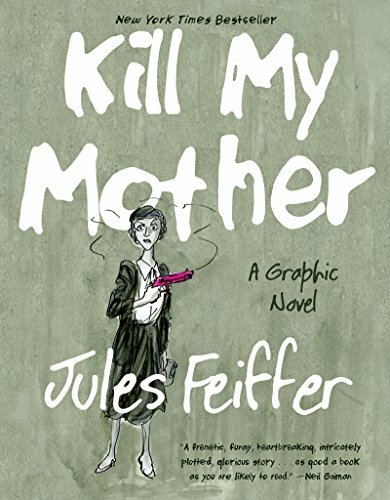 Bluesy, fast-moving, and funny, Kill My Mother is a trip to Hammett-Chandler-Cain Land: a noir-graphic novelÂ like the movies they donât make anymore. About: A Vanity Fair Best Book of 2014 A Kirkus Reviews Best Fiction Book of 2014 When three daunting dolls intersect with one hapless heroine and a hard-boiled private eye, deception, betrayal, and murder stalk every mean street in…Kill My Mother. About: A Vanity Fair Best Book of 2014.